NASCAR's cultural force also is felt in other ways, as its fans are the face of America's automobile and driving culture. A recently published Simmons National Consumer Survey revealed NASCAR fans own more cars, drive farther and simply like driving their vehicles more than non-fans. And when race fans drive, often they're headed to a NASCAR race. The NASCAR NEXTEL Cup racing season, under way since last February, lasts through November, running on 22 tracks in 19 states this year. The calendar is dotted with great city destinations, such as Atlanta, Chicago, Dallas-Fort Worth, Indianapolis, Las Vegas, Miami and Phoenix and Kansas City, MO. I look forward to every weekend during race season, especially if I'm traveling to watch a race." said Ron Kromer of New Jersey. Kromer is the local chapter president of the Official NASCAR Members Club, the sport's fan club organization launched at last year's Daytona 500. "I look forward to the tracks and meeting with other members from other states," he said. 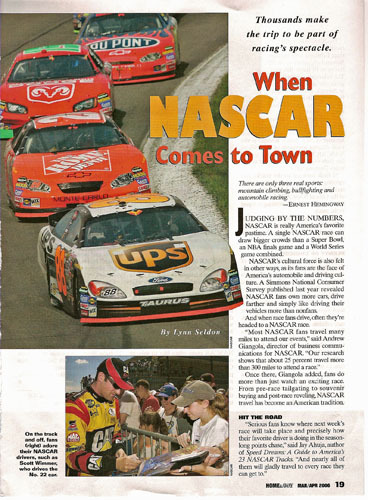 "I think being a member of the Official NASCAR Members Club has a lot to do with fans wantingt o travel to the races. "The most fun we had last season was at Dover International Speedway. I organized a trip of three buses for friends and family to go see the race." For the race on Sept. 3, Ravenswood Winery will create a wine garden at the track, featuring wine tastings, interactive displays, a wine learning center, and a wine lounge. Infineons Carneros Marketplace at NASCAR features local wines, fruit, cheese, breads, and more. Those who travel great distances to NASCAR races often like to splurge once there, and Infineon's Raceway Club at Turn 7 is a great example of a pricey indulgence. The package includes a weekend event pass, catered lunch on Saturday and Sunday of race weekend, total access to the VIP hospitality tent, closed circuit television, NASCAR driver appearances and fan forums, club credential holder and lanyard, race program and a reserved seat in the Turn 7 terrace area or in the shaded tent with television. In between the West and East coasts, many other tracks attract veteran and soon-to-be-veteran NASCAR followers. Ahuja says he loves donning his gear at any NASCAR track. Just the way fans like their favorite American pastime.